An Eastbourne police officer has been dismissed for not showing up for work and trying to ‘lie his way out of trouble’. PC Michael Robinson was dismissed without notice after a public gross misconduct meeting heard of a number of honesty and integrity issues, said Sussex Police. Detective Superintendent Steve Boniface described the PC’s behaviour as ‘a violation of trust’ and said the officer, who had been with the force for 16 years, ‘let down’ his colleagues, Sussex Police, and the public. 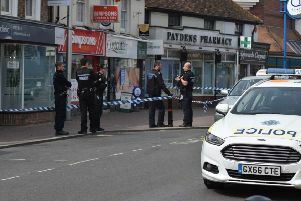 The 36-year-old had been expected on duty with colleagues in Eastbourne for a 7am-3pm shift back in May, the hearing heard on Tuesday (August 14). When PC Robinson, who served Sussex Police since 2002, didn’t show up, one of his colleagues contacted him to find out where he had been. The hearing at police headquarters in Lewes heard he responded in a text message that he had been to Lewes to collect something and then returned to Hammonds Drive police hub. Sussex Police said he repeated this information in another text message to a supervisor. The following day, he emailed supervisors saying that he had been unwell, repeating that he had been to Lewes and then returned to Eastbourne to work. Due to concern about his explanation, the force’s professional standards department was asked to investigate and enquiries showed that he had not been to Lewes, there was a discrepancy in his booked and actual starting times, and he had made it difficult for anyone to contact him as he had left his radio and work phone at home. Sussex Police said PC Robinson acknowledged his lies when challenged. When interviewed he reportedly explained he had returned home to collect some medication and left his work phone and radio behind before returning to a car park near Hammonds Drive where he remained studying in his car for the remainder of his shift. He also confirmed only a very small part of the day was spent on police work and as such he had not provided value for money. When questioned further about the medication, it emerged that he had not declared it when he applied for another post in the force. This false declaration would have meant that his application would not have been considered, police said. He faced and admitted to five allegations against him – one of duties and responsibilities in not being available for work and four of honesty and integrity in relation to his lies and the false declaration. Superintendent Boniface, head of the Sussex Police professional standards department, said, “We expect the highest possible standards of our officers and staff and we take any report of inappropriate behaviour extremely seriously.